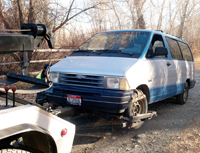 A senior citizens' assistance van that was stolen Monday afternoon in downtown Hailey was found the following day—abandoned and wrecked—in Colorado Gulch. The undercarriage and frame were damaged and Kimberly Coonis, executive director of the nonprofit Senior Connection, said the van is likely a total loss. "We don't know for sure yet, but that's what we've been told by our mechanic," Coonis said. The van was insured but, she said, "it's an older van and we're not likely to get a lot out of it." The silver and blue 1993 Ford Aerostar was used by the Senior Connection to transport senior citizens for outpatient care to doctors and St. Luke's Wood River Medical Center, or for other errands such as hair appointments. Buying a new one may not be easy. The Senior Connection is operating on a $700,000 budget, most of which comes from donations or fundraisers. Raising money in economically difficult times is becoming more difficult for nonprofit organizations. "I'm hoping to let people know what's going on and we have the need now for a new car," Coonis said. The van was stolen shortly before 4 p.m. while parked on Main Street in front of the Carquest auto parts store. The driver, a Senior Connection caregiver, was only away from the vehicle for a few minutes, but she left the key in the ignition. Hailey Assistant Police Chief Dave Stellers said three vehicles have been stolen in Hailey during the last two weeks. In each instance, the vehicles were left unlocked and with the keys inside. Hailey Police issued a press release Wednesday advising drivers to be more cautious with their vehicles. Stellers went looking for the van after it was reported stolen. He found it Tuesday afternoon in Colorado Gulch, where it had been driven off-road and was damaged and stuck. A bicycle valued at $2,000 was still in the van, as was the caregiver's purse, though it was missing more than $500 in cash. Stellers said Thursday that police have no suspects. "The investigation is still going on," he said. "We think it's related to all the other vehicle thefts we've had lately. I just think it's somebody taking the opportunity to go joyriding." Coonis said she's appalled at the theft. "It's unbelievable that it can happen in the middle of the day in downtown Hailey," she said. "I'm hoping somebody might come forward who saw something." The theft of the van was the latest crime besetting the Senior Connection, which provides activities and services such as meals-on-wheels for senior citizens. Located on Third Avenue in east Hailey, the Senior Connection is undergoing expansion and Coonis said nearly $1,000 worth of tools and a pallet of pavers have been stolen from the construction site. "Over the past year we've been vandalized, had cars broken into, mirrors on our bus broken, the window out of the bus broken and now our van stolen," she said. "I don't know if they're targeting us or if we're just an easy target. "We are so desperate for funds to help with meals, activities, transportation and in-home care programs, and I know this doesn't sound like a lot to some people maybe, but to us it is devastating and our dollars are so tight every month."